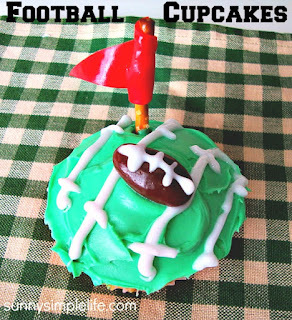 If you are looking for Superbowl cupcake ideas these easy football cupcakes are perfect. 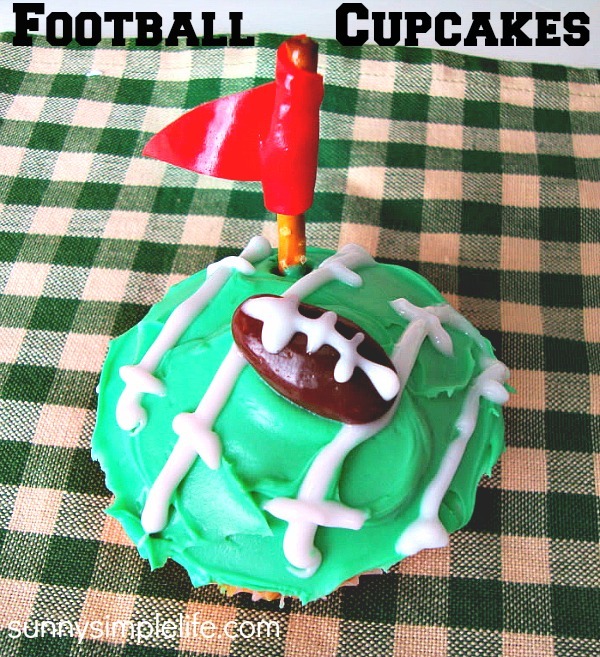 I love to bake but need super easy football cupcake decorating ideas and here is one we are sharing. The girls and I have made these several times and these are the perfect cupcakes to bake with kids. All you need are a few simple ingredients but together they make an easy football cupcake themed recipe. Because all you have to do is assemble the different pieces, these are simple cupcake decorating steps. Superbowl Sunday is all about the food right? Along with all the good snacks and finger foods you have to have dessert and these Superbowl cupcakes are on tap for this year. It is a tradition now. Bake your cupcakes according to the box directions in paper liners. Cool completely and frost with the green frosting. Next adding the football field hash marks. Set the chocolate almond on the top center and add the football stitching with the white piped frosting. Cut your fruit leather in long thin triangles. Wrap the wide end of the fruit leather just around the top of the pretzel stick to create the flag. Place on the side of the cupcake. Ha! Those are sure cute! I'll pass along the recipe. Thanks. Oh how cute! Thanks for the idea!! What a lovely recipe! These cupcakes look really cute.